Snake temples, or Naga Shrines, are found mainly in South India. Here again exclusive Nagaraja Temples are few. 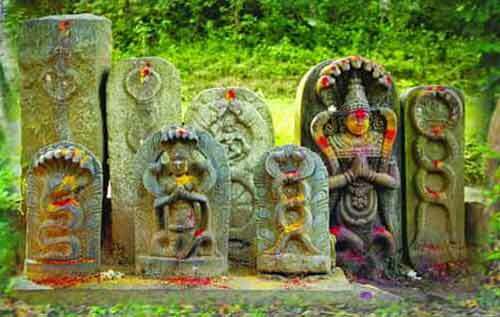 Majority of the shrines are either dedicated to Shiva or Subrahmanya (Kartik) but the naga worship is more famous. Here are few famous Snake Temples in India. Bhujia Fort is located on the outskirts of Bhuj in Gujarat. Legend has it that, the fort is dedicated to the last Naga Clan Bhujanga, who attained martyrdom. In memory of his great sacrifice a temple was built on the Bhujiya hills and it is known as the Bhujang Naga Temple. Nag Panchami fair in Shravan month attracts huge crowd. Currently, the fort is in the possession of the Indian Army. As per Hindu Scriptures, Sheshnag, also known as the king of snakes, created a lake near Pahalgam. It is believed that Sheshnag still lives here and hence a temple dedicated to the serpent god is built on its banks. Pilgrims on their yatra to Amarnath Cave visit this lake and worship Sheshnag. The sanctum sanctorum of this temple located near Davangere has an ant-hill with a naturally formed image of Lord. Sightings of a golden colored snake around the temple by devotees have made this temple famous. No moon days or Amavasya attract maximum crowd. A temple dedicated to Lord Shiva with importance to Ketu Navagraha, who has the body of a snake. It is believed that important snakes in Hindu scriptures like Dakshan and Karkotaka offered prayers to Shiva here. Nagaraja Temple at Nagercoil in Tamil Nadu is dedicated to serpents. The temple is famous for numerous unique rituals. The huge temple is visited by people from all around the world. Those suffering from astrological problems related to Nagas find relief here.